You may receive updates from Kanawha Forest Coalition, the sponsor of this petition. 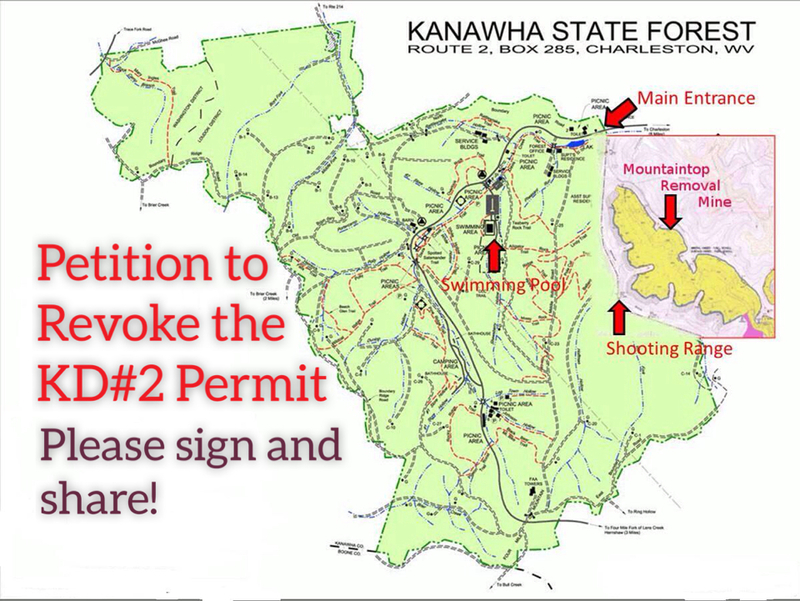 Revoke the permit for the KD#2 Surface Mine adjacent to Kanawha State Forest. On May 5, 2014 the WV DEP issued a surface mining permit allowing a coal company to use explosives to blast off over 400 acres of forested mountaintop right next to Kanawha State Forest and less than 5 miles from our state capitol building in downtown Charleston, WV. The permit authorizes Keystone Coal to use explosives to mine coal within 588 feet of Kanawha State Forest and permits them to restrict public access to our roads, trails, and shooting range for the next ten years. Mountaintop Removal mining also has long term adverse impacts to our health, our quality of life, and our region's potential for a long-term sustainable economy. Help us protect Kanawha State Forest and our community! We are calling on Governor Tomblin to immediately and permanently revoke the KD#2 surface mine permit. You do NOT have to be a WV resident to sign! No matter where you live, you can help. You do NOT have to be 18 or older to sign, No matter your age, you can help. Help us reach 2000 signatures! Share this petition with your friends and family on Facebook, twitter, email, at work, and in your neighborhood. We will protect our WV mountains! Scroll down to read the full text of the petition to Gov. Tomblin. We request that you direct DEP Secretary Randy Huffman to rescind the permit for the KD#2 surface mine (Permit #S300609) adjacent to Kanawha State Forest. The WVDEP and WVDNR failed to appropriately minimize the adverse impacts of the KD#2 mine to Kanawha State Forest as required by law. Adverse impacts to Kanawha State Forest include potential danger to Forest users from blasting, restricted access to the trails and shooting range, and diminished viewshed and user experience. Adverse impacts to the Charleston and Loudendale communities include heightened risk of catastrophic flooding on Davis Creek, potential well water contamination for homeowners on Middlelick Branch, increased risk for health problems associated with surface mining (including pulmonary disease, heart disease, cancer and birth defects), negative impact on tourism, and damage to our local economy due to tarnished state image and reduced quality of life. In light of these unavoidable negative impacts to the Kanawha State Forest and to local residents, we believe permit #S300609 should never have been issued. We call on you, Governor Tomblin, to direct DEP Cabinet Secretary Randy Huffman to immediately and permanently rescind the KD#2 permit.